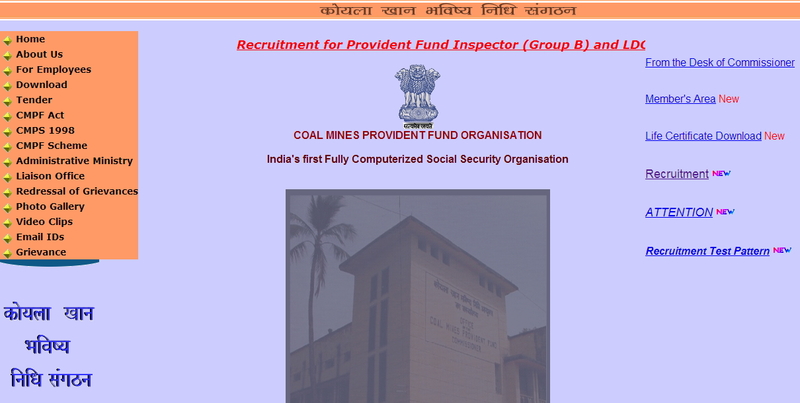 http://cmpfo.gov.in/ is the official website of Coal Mines Provident Fund Organisation (CMPFO) Dhanbad. Applications were invited for the post of Lower Division Clerk and Provident Fund Inspector in CMPFO. Qualification: Intermediate and English Computer Typing 35 words/minute and Hindi Computer Typing 30 words/minute. Eligible candidate can apply for the post through online by visiting the website http://www.cmpfo.gov.in/ and clicking on Recruitment and click on Online Application. Scan your passport size photo and signature before clicking on Online Application for using while filling the application form. Fill the online application form and upload the photo and signature and submit the application and payment chalan will be displayed download and take a printout of it and make the payment in any SBI bank branches 2 days after applying online. within 3 days after the 2 days and complete the application procedure. For Provident Fund Inspector: Test of Reasoning (50 Marks), Quantitative Aptitude (50 Marks), English Language(50 Marks), General Awareness(50 Marks). Can we fill for both positions! Can we fill for both application! what will be the job destination is it in Mumbai? candidate can apply for both the post based on the eligibility. Date for downloading of call letters from 1st week of March, 2013. Admit kab milega.fund inspector& ldc ke practice set chahiye. when we will get the admit and from which link? Examination date is postponed from 24th March 2013. New date will be informed soon. Admit card will be mailed to the e-mail address. visit the website for sample question papers. when we will be get the admit card? and why are postponed the examination.& when a new date will informed soon. Exam pospond kyu hua? ? ? sir give me idea when exam will be. Fees ko hadaf kar gaye cmpfo wale.drive hi cancel kar di. Sir ji kuch to idea btaiye. . . . Kb hoga exam . . . Ya hoga v ke nahi? ? ? Kya aap v usi office me kam krte hai sir ji? ? Hi guys, cmpfo pf & ldc ka exam nahi hoga balki apply karane walo ko direct call kiya jayega interview and skill test ke liye, so enjoy without tension. 20-05-13. I got latest news regarding cmpfo ldc. Ldc exam will be held on 16 june 13. So start preparing now. Your friend hariom diwana from patna. Coil gotala ho jane ke karan exam date cancle kar diya gaya h... Jab gotale bajo ka pata chal jayega tab exam conduct kar diye jayege...i. i.e. Agale janam me...tik h.